Is COPD or asthma taking your breath away? and breathe—a fuller and more active life! A lung disease can be debilitating. It can turn a simple flight of stairs into an insurmountable obstacle. It can be heartbreaking as you watch your child sidelined from his or her favorite sport by an asthma attack. And it can be deadly: Chronic Obstructive Pulmonary Disease (COPD) is the third leading cause of death in the United States. Today, more than 34 million Americans suffer from asthma or COPD. If you or a loved one are in this group—or if you want to dramatically lower your risk of lung disease—you are invited to send for Chronic Obstructive Pulmonary Disease and Other Lung Disorders. This authoritative, just-published report is packed with strategies for preventing the causes and minimizing the consequences of a lung disease, including emphysema, chronic bronchitis, bronchiectasis and asthma. Published in collaboration with Duke University Medical Center, this 80-page report clears the air when it comes to understanding the conditions that give rise to a lung disease. You’ll learn which factors increase your risk of COPD even if you’ve never smoked…what “asthma triggers” you can easily sidestep (and which are likely to trip you up no matter what) … and how your family history may determine your child’s susceptibility to a lung ailment. You can save your breath!That’s right. You can be proactive. You can control lung disease and arrest its symptoms. That’s what this instructive “take charge” report is about. In it you will be briefed on medical progress that’s enabling doctors to identify specific lung diseases earlier and more accurately. And you’ll learn how these diagnostic advances are facilitating the introduction of targeted, patient-tailored treatments that can halt—and even eliminate—those conditions that can disrupt your activities or affect your life. Because the first symptoms of lung disease can be mild, they are often ignored. In the report you will learn those early warning signs of COPD and asthma that should get you to your doctor. You’ll gain insight into which tests are best. And you’ll examine emerging techniques to assess pulmonary function, distinguish between diseases, and determine the optimal course of treatment. You’ll understand how today’s medicines work—and which are right for you!Today, doctors have an arsenal of weapons for managing COPD and asthma. For just about everyone with COPD or asthma, drug therapy is part of that regimen. In some cases that may mean simply using an inhaler. But which type of inhaler? Metered dose, dry powder, or nebulizer? Short-acting or long-acting? A beta-agonist to relax muscles or an anticholinergic to prevent constriction? The report will explain—in clear language—the purpose and place for each. You can control lung disease and arrest its symptoms. 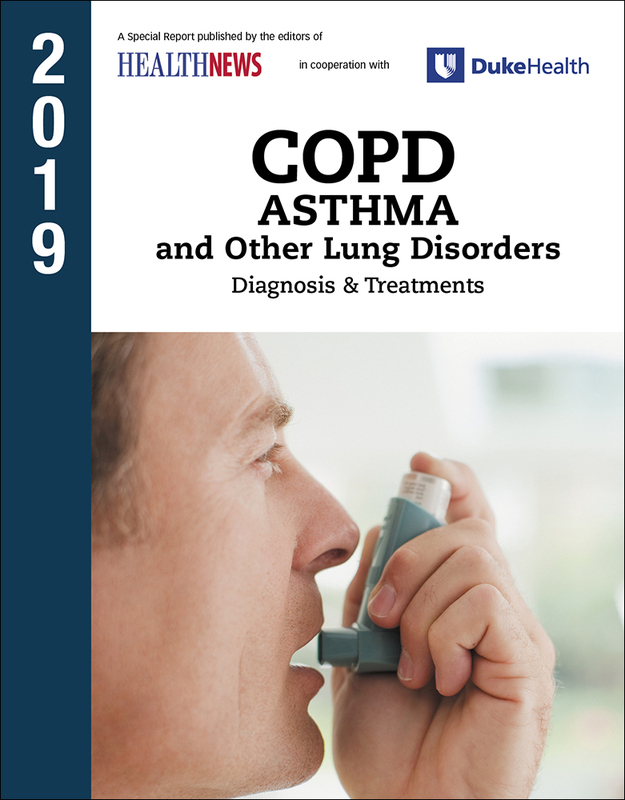 Get the authoritative 2019 report COPD (Chronic Obstructive Pulmonary Disease) from Duke Medicine. Prevent the causes and minimize the consequences of lung disease, including emphysema, chronic bronchitis, bronchiectasis and asthma. Plus, you’ll be briefed on breakthroughs in controlling COPD. You’ll read about new combination therapies that speed and simplify drug delivery, how a novel approach that includes “breathing lessons” is helping men and women with moderate COPD resume normal lives, and that vitamin D may improve lung function. The report will get you thinking twice—and acting at once! !For anyone with COPD or asthma, this report is a must-read. It is informative and instructive. It will not only educate you on advances in diagnosis and treatment, but will show you how you can build your defenses against the irritants that cause COPD, and the triggers that precipitate an asthma attack. Did you know that if you have COPD, cough suppressants do more harm than good? And do you know which common over-the-counter (OTC) medicines can set off asthma symptoms? Or that eating more fruits and vegetables may reduce COPD symptoms? Find out more in the report. In an evening’s reading, you set the course for a lifetime of better respiratory health. The report is filled with practical guidance and preventive strategies to lessen the risk and repercussions of a lung disease. It will help you work with your physician to select treatment protocols targeted to your condition and your needs. It will take away needless apprehension, and give you solid direction. The Annual Edition is yours to examine risk-free!COPD and Other Lung Disorders: Diagnosis & Treatment is available to you at the lowest price you’ll find anywhere. The cost is a very small price for information that can make such a large difference in your life or that of a loved one. Order today and if the report doesn’t match your expectations, let us know and we’ll fully refund your money, no questions asked. There’s no reason to let a lung disease like COPD or asthma control you when you can control it! Take action now! Click here for your copy of COPD and Other Lung Disorders: Diagnosis & Treatment today! And to ensure that you stay on top of important findings as doctors and researchers continue to advance detection and improve treatment of lung ailments, we will reserve future annual editions for you on a priority basis and at our lowest price. We will notify you by postcard or email before the next edition is released and shipped to you. If you don’t wish to receive it, just return the card within 30 days. You will also be able to review each future issue before deciding to keep it.